These past couple of months have been particularly exciting for Star Wars fans. The November release of Star Wars: Battlefront, a multiplayer-focused video game from EA Dice, was mainly pertinent to gamers however the December release of Star Wars Episode VII: The Force Awakens in theaters appealed fans of the franchise around the world. As someone who is a long time fan of the franchise and a gamer, both of these releases have brought me nothing but pure joy. While I initially wanted to write an article about the film, I decided instead to focus on Star Wars: Battlefront first as it is a game I’ve been meaning to share my opinions on for a while now. Since the game’s release on November 17th, 2015, Battlefront has been subject to much scrutiny and criticism from gamers. The game received mixed reviews from professionals, earning it a Metascore of 72/100 (28 positive reviews, 27 mixed and 0 negative), which is pretty good consider its genre and imperfections. However it holds a score of 4.9/10 (mostly negative) on the user side of the line with most complaints centered around the lack of a single player campaign and general content overall. In its own way the game has become a controversial issue in the gaming community. I, for one, am rather enjoying Battlefront but it’s far from perfect and thus I was inspired to put this article together in order to share what I find to be positive and negative about the game as well as why I feel that way. Keep in mind that these are my personal opinions and aren’t meant to be taken in any other way. Let’s start with the negative aspects of Star Wars: Battlefront. Weapons: In Battlefront there is a selection of blasters made progressively available as you rank up through playing the game. The last available blaster is unlocked at rank 25 with the max rank in the game being 50 (as of now). There aren’t very many blasters to unlock overall and the last one is unlocked relatively early, so after that there is really nothing to look forward to weapon-wise as you rank up. Given that you can’t upgrade or unlock attachments for these blasters it’s a bit of a letdown overall. Of course this is something that could be remedied through future expansion packs, but as of now it just seems a bit bland considering this game is a multiplayer-focused shooter. Multiplayer Maps: There aren’t an awful lot of maps in Battlefront and due to this we end up playing on the same few maps over and over again. This is a minor complaint for me, but one worthy of note given that there could have been so many more due to the setting in the Star Wars universe. Upon the game’s release there were only four planets on which to play with about two maps per planet in smaller game modes and one map per planet in larger game modes. The recent release of the free Battle of Jakku DLC added one new small map and one new large map on the planet of Jakku, bringing the playable planet count up to five. This gives me hope that future expansions will offer up more planets and maps, but the initial release should have offered more on principle. Expansions/DLC: In the previous two sections I mentioned my hopes that future expansions will add more content and that is a problem in and of itself. While I expected this to be the case and have made peace with it on my own, it is disheartening to know that I purchased a game at full price which is technically incomplete and will be added on to at my financial expense in the future. Star Wars: Battlefront released at the standard $60 price point with a season pass priced at $50, which will provide all future expansions/DLC. So basically to get the full game I will be paying $110 (or more, if I choose to buy the expansions separately outside of the season pass), which is pretty annoying. Sadly, that is the standard for games of this nature at this point in time, but I don’t have to like it and I’d wager that I’m not alone in feeling that way. Character skins/selection: Battlefront does a fabulous job at allowing players to customize their characters, as far as skins go. The customization is purely cosmetic but allows you make your characters look how you want them too, which I find to be pretty cool. You can choose from a variety of male or female characters with further variations in looks, ethnicity, hair styles and age. You are able to choose a different skin for your Rebel and Imperial characters and there are even a handful of preset aliens to choose from once you reach the proper rank. The variety and depth of these skins are an unprecedented feature of multiplayer games as very few games in this genre even allow you to choose between male and female, much less choose your race and age. Audio/visual content: This game is absolutely beautiful. It’s astonishing to see such well rendered textures, graphical clarity and expansive scenery in maps of this scale. 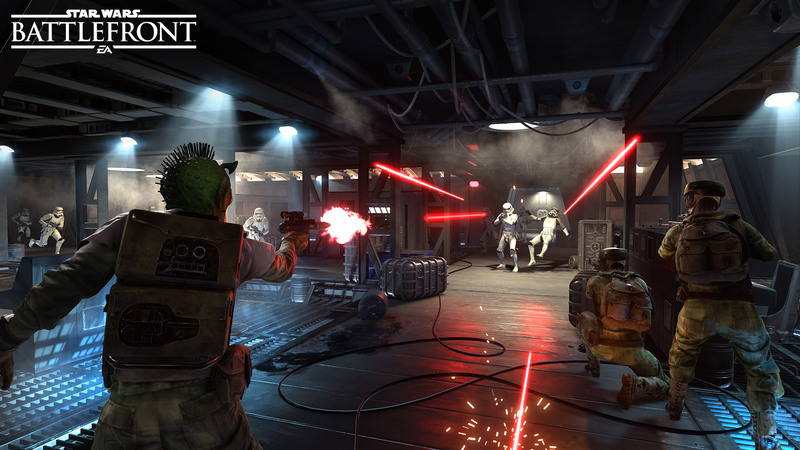 From a simple piece of cloth blowing in the wind to massive star battles taking place overhead during gameplay, Battlefront offers up top of the line visuals in large-scale settings. In addition to the visuals the game features some fantastic sound effects providing an overall engrossing experience on an A/V front. Multiplayer-focus: While many gamers expressed disappointment or frustration in the fact that this game offers up no real single-player campaign, I for one found that to be a positive. Don’t get me wrong, I love a good story and I’ve made it clear over the years how important narrative and writing in video games are to me, but at the same time I love a good multiplayer game. When I play games like Battlefield and Call of Duty, I don’t even bother with the single-player campaign, so Battlefront’s lack of single-player works for me. While a campaign set in the Star Wars universe probably would have appealed to me more than any seen in Battlefield or CoD, I know that future games taking place within the Star Wars universe will offer up a better campaign and for now I can have fun with multiplayer. There is nothing wrong with a game that basically only features multiplayer with a small selection of single player/co-op missions and I personally refuse to fault a game for featuring that set-up. If the multiplayer was poorly done that would be another story, but Battlefront features an enjoyable multiplayer experience which is perfect for me when I’m in the mood to jump online and blast some stuck-up, half-witted, scruffy-looking nerf herders. Heroes/Villains: Being able to play as legendary Star Wars heroes and villains such as Han Solo and Darth Vader is amazingly fun. The addition of these characters in most gameplay modes really adds to the game in that it allows fans of the series to play as their favorite characters as well as provides somewhat of a boss-type character to fight against. Overall this feature is really neat and is at the center of one of my favorite game modes, Heroes v. Villains, in which both sides get three heroes or villains who must duel one another for supremacy. Overall I have rather enjoyed playing Star Wars: Battlefront and despite its flaws I find it to be a really fun game. One of the best aspects of the game is that it’s a Star Wars game, so fans like me end up having great fun while playing through familiar settings accompanied by classic musical themes from the franchise. I suppose that if one was not a Star Wars fan or at least wasn’t a very big fan, this game would lose a lot of charm and subsequently a portion of enjoyability over time. Also if one was not into multiplayer games at all I can see how this game would not appeal to them, however that is a personal preference and not one that I feel is fair to criticize the entire game for. Given my thoughts and opinions of Battlefront I would definitely recommend that fans of Star Wars who enjoy multiplayer games pick this one up. Even if you choose not to purchase the expansions, it’s a fun game that is worthy of your time. When I first picked this up launch night I couldn’t get in to it. I’m a huge Star Wars fan but for some reason I just wasn’t feeling it. Perhaps it was the fact that I had been playing the new Call of Duty pretty non-stop for over a week at that point and here was another multiplayer FPS. However, I did return to this game about two weeks ago and started putting more time in to it and I have to say it’s a lot of fun and stunningly beautiful. I’ve caught myself getting killed because I’m spending time looking at stuff on the map instead of paying attention to what’s going on. I’d have to agree, if someone is a Star Wars fan and a multiplayer fan I think they’ll love this game. But if you’re neither of those things or perhaps only one of them, probably not so much.